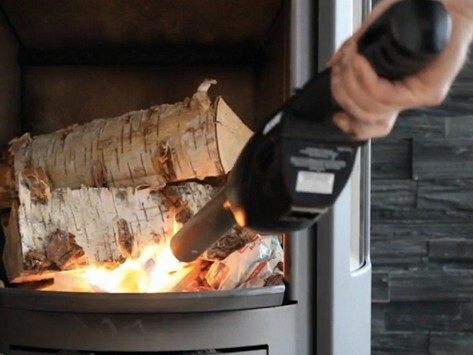 A portable air-driven fire lighter that jets a 4-inch flame, instantly igniting charcoal and wood before delivering airflow to quickly spread flames. Please refer to the side by side feature comparison to choose the Airlighter that is best for you. Built-in blower provides 60 minutes of blower use with fresh batteries. Expect roughly 10 minutes of burn time if you fill the Airlighter 420 to the max line with Airlighter Fuel. Dimensions: 16” x 2.2” x 3"
Dimensions: 21" x 3.5" x 3"
I gave this to my fireplace burning, steak eating boyfriend and he LOVES it!! The air works great to get the fire burning. Whether you're trying to light a campfire, charcoal grill, or wood stove, fire-starting can be a time-consuming, smoky, and smelly process. But with Bison Airlighter's super-charged butane lighter, you can go from zero to lit in seconds flat. There’s no need for chemical starters or lighter fluid. 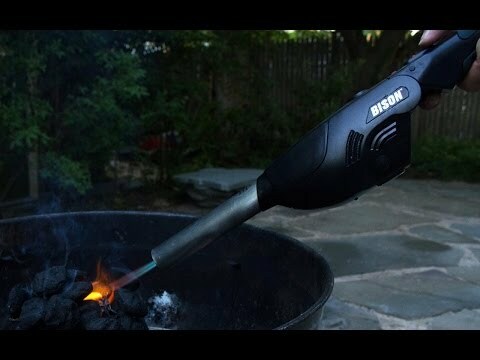 Developed by The Bison Company in upstate New York, the commercial grade Airlighter jets a 4-inch, 2600 degree flame and fans it with pure air, quickly dispersing the blaze throughout a wood or charcoal pile. In less than 5 minutes a smoking hot fire is ready when you are (perfect for getting food on the grill quickly). An adjustable grip and extended barrel make the Airlighter easy to strategically place, while special technology leaves the handle cool to the touch. With a child-proof lock, integrated LED flashlight and bottle opener, this handy tool will be a favorite essential, indoors and out, all year long.